Kim Kardashian shares new adorable photos of baby North West and talks all about her bad pregnancy experience as well bonding with her little one. 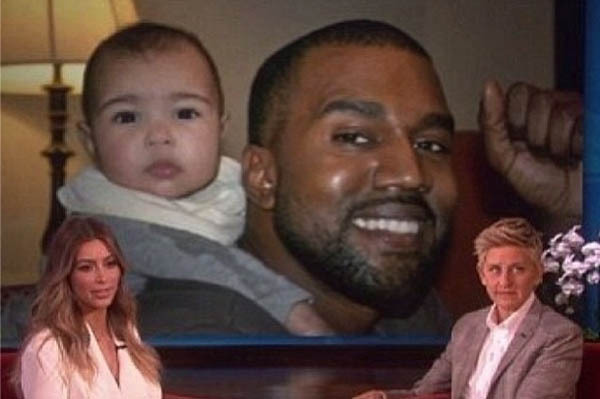 Making an appearance on The Ellen DeGeneres Show on Friday, Jan. 17, Kim Kardashian revealed three new super-cute photos of her baby girl North West, and talked all about her difficult pregnancy. But she also talked about how happy she is with her baby and how she’s bonding with her little cutie. The new mom gave Ellen access to new photos she had in her iPhone so they could be shared with the viewers. Kardashian could do nothing more than gush about her little 7-month-old, and as the photos show, she has good reason to be proud of her adorable daughter with fiancé Kanye West. The reality star actually revealed that she’d like about six children although she wouldn’t wish the woes of pregnancy on anyone. She added that while “it’s all worth it in the end,” her body went through a rough time. “Pregnancy was not a good experience for me. At all,” she confessed. And when DeGeneres noted how many women say pregnancy is a beautiful thing, Kardashian assured her that “they are lying,” adding that she had a very hard time physically as well as mentally with the whole process. When asked about how West is handling fatherhood and if he’s a hands-on dad, the 33-year-old beauty said that he’s just “the most amazing dad. He loves her so much.” But Kardashian admitted he’s not “a diaper-changing kind of guy,” although if he really had to change a diaper, like in a dire emergency, she said he would do it.